In springtime, homeowners often begin improvement projects that will enhance their house’s curb appeal and boosts its value. And there’s a great way to add to your home’s space while also providing more ways to enjoy the outdoors as the weather warms up—adding a beautiful, inviting porch, patio or deck. Spring is the perfect time to add to and improve upon the outdoor spaces of your home. Here’s a closer look at the advantages of investing in a patio, deck, or porch this year. • These outdoor spaces typically don’t require homeowners to invest in drywall, carpeting, tile, plumbing, insulation or other similar elements that make adding a new room pricey. 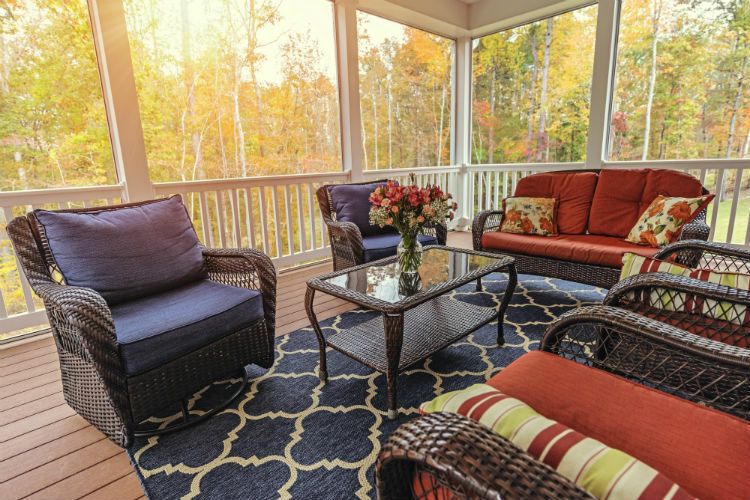 • Porches and decks don’t usually count as living space, so they don’t typically increase your taxable square footage or raise your property taxes. • Because home buyers enjoy nice outdoor spaces, installing a porch, deck, or patio can give your home a boost in perceived value if you wish to sell it. • A place to enjoy food and drink, conversation and scenery — and a great way to give you more room to invite more people! If you’re planning to entertain large groups outdoors on a regular basis, or if your family is large and enjoys grilling all summer long, add a deck that is roomy enough for a grill or two and ample seating. • Do you want an open area or a closed-in space? An open deck that leads naturally into your backyard may be ideal for throwing large, lazy, casual summer get-togethers. A screened-in patio is an excellent choice for homeowners who value privacy and quiet alone time. An enclosed porch with glass windows provides added protection from thieves and weather for valuable possessions such as a stereo system, your favorite books, or special furniture. • What design elements matter most to you? Do you prefer a space designed to withstand active young children and grandchildren? Do you want a space that allows you ample places to hang twinkle lights? Do you want built-in elements like a luxury grill or fun features like a chimenea or freestanding firepit? Your home should be a warm, inviting, comfortable refuge that enhances your lifestyle—inside and outside. Adding a deck, porch, or patio—or replacing an old, worn existing one with a fresh, new, beautiful version—is a great home improvement project that will boost your home’s value and your enjoyment of it all year long. The Siding & Windows Group loves making Chicago area homeowners’ dreams come true with beautifully installed, superbly performing outdoor spaces that allow you to live your life to the fullest. And there’s no better time than the present to get started on planning and building the porch, patio or deck you’ve been longing for. We use the only premier, attractive, long-lasting building materials to create decks, porches, and patios that homeowners are happy to come home to. And if you have a special request or unique design idea you’d like to realize, tell us about it—we love finding ways to create the home exterior you’re craving. Simply schedule a consultation and a free quote to get started on making the most of your home’s outdoor spaces this year.